Aaliyah Style: Which Liyah's sunglasses u love the most ? Was she a great of good singer? 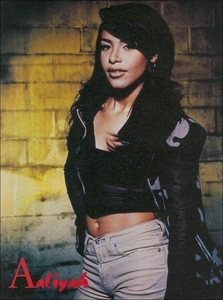 Aaliyah as an actress. Trish O'Day of Akasha ? LOS ANGELES, Sept. 15, 2015 /PRNewswire/ -- Xyrena announced today that it is releasing Aaliyah door Xyrena, a fragrance tribute to the late performer, who was known as the "The Princess of R&B." This first and only official Aaliyah fragrance was developed in close collaboration with Diane & Rashad Haughton, the singer and actress's mother and brother. It comes 14 years after her tragic passing. From Drake's reported tattoo of Aaliyah on his back to Timbaland's admission to being in love with her, the late singer has been the talk of the blogosphere recently. Aaliyah, u recall, died at the age of 22 in a tragic plane crash with eight others weeks before 9/11. Unlike other beroemdheden who have died young, drama hasn't really overshadowed Aaliyah's legacy. Perhaps that's because she kept her family close. "It still has my signature style, but meer of a rock flair to it. I feel each song has something u don't normally hear today. " "Just think about love. Most songs are about love. I got happy and sad love songs together." Aaliyah's reason was to sing us muziek which she did but went above and beyond. a video was toegevoegd: Victoria Kazadi -Dance Dance Dance Poland performing Aaliyah's "Try Again"
Dave Bing feat. Lil' Mo "Somebody Gonna Die Tonight"
Timbaland & Magoo "We At It Again"
Dave Hollister "Pump the Brakes"
Remembering Aaliyah - new muziek to listen to!